Seems like you need a password for everything nowadays? Not able to remember all of them clearly for your Mac? Your best bet is to get a Mac password manager. Now the best password manager app for Mac gives you the option to sync or keep them local only, change web passwords with a click, login in to your sites for you, and more. In this page, we introduce the top 5 Mac OS X password managers. 1Password for Mac, only part of the 1 Password suite, serves as a great password bank that you don't need internet connectivity in order to view. 1 Password uses a local file to store encrypted passwords. It supports synchronization of the password vault using iCloud. iCloud also supports synchronization over Wi-Fi between Windows, Mac and iOS clients. Because the 1Password vault is contained in a single file, you gain the convenience of a portable password vault without having to store your passwords on the Internet. If cross-platform support is a necessity for you when it comes to storing and managing passwords, 1 Password for Mac hands down the best option. Cost: Free. A Premium version is offered for $1 per month and includes mobile version, among many other features. 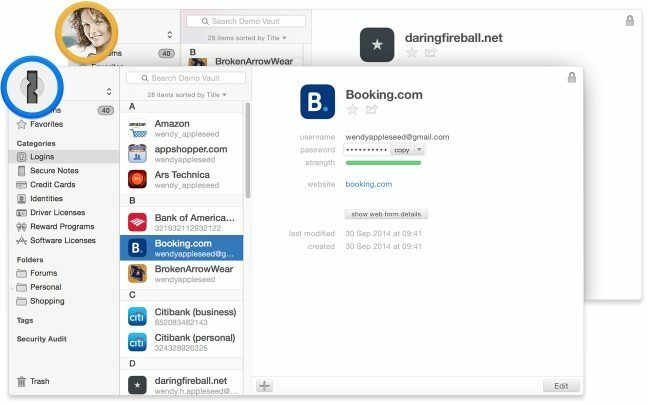 LastPass for Mac isn't actually a standalone app but it is a great password management service as long as you don't mind having to have an internet connection in order to access your vault on your Mac. 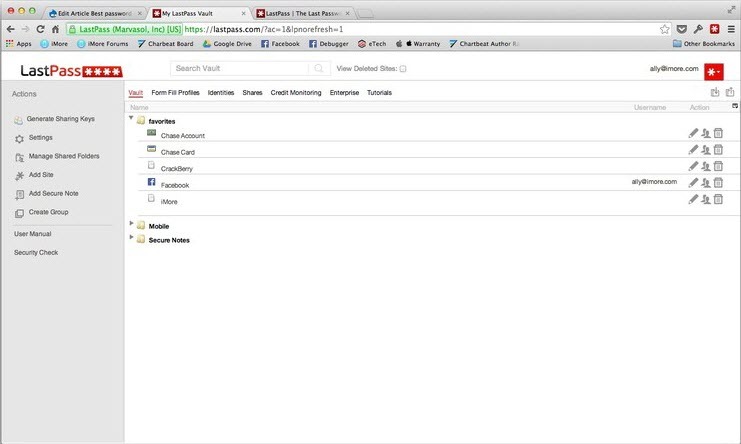 The focus of LastPass seems to be protecting against attacks such as breaches, keyloggers and phishing. LastPass has recently partnered with PwnedList and added a new feature called Sentry that automatically emails you whenever a breach has been reported on one of your online accounts. 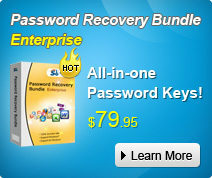 They also offer a couple of different methods to protect against keyloggers. RoboForm supports a wide variety of different browsers. It focuses on speeding up your internet browsing experience by helping you automatically login to your facourite sites once you've set up all the needed information. Not only can you do this one site at a time, as you are surfing you can batch-login to multiple sites at once. DataVault focuses on managing and securing your data. Along with the usual password management features, DataVault supports iCloud backup, plus Wi-Fi, WebDAV, and Dropbox synchronization. It also lets you resolve conflict resolutions manually, or you can choose whether the DataVault allows you all sorts of ways to arrange data stored within the app, like by grouping items, category and types. When you quit DataVault, it automatically clears your clipboard so it can't be used to poach your data. 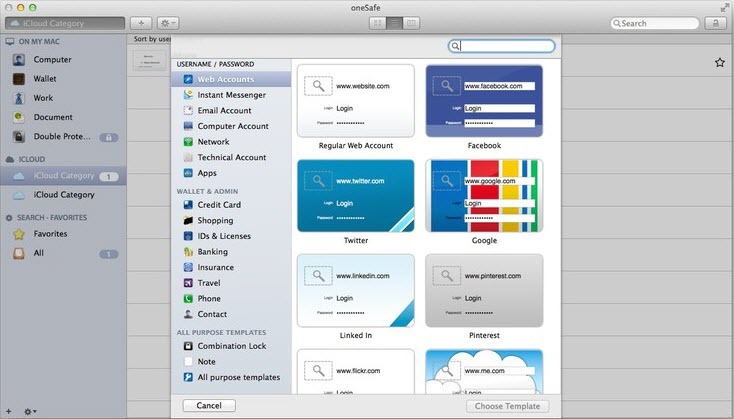 oneSafe is a standalone password management app for Mac that specializes in storing all your sensitive data before anything else. There may not be autofill options and browser integration but what oneSafe lacks in that department, it more than makes up for in security. For starters, oneSafe is the only app on this list that supports tri-pin security. You also have a vault inside of your oneSafe vault that requires an additional password to access it. All of this data also syncs to the iOS version via iCloud if you want it to. While there are so many choices, you ultimate decision between those password managers for Mac may come down to your own personal preference for navigation and organization of your data. For people who lost login password for Mac, 3 free Mac password crackers may be your choice.